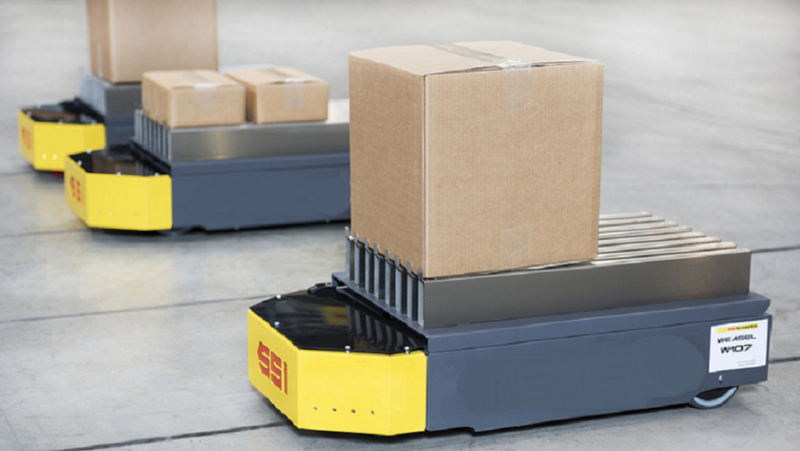 Home / Blog / Industry 4.0 / AGVs, Automated Guided Vehicles, still do not know what they are? The AGVs allow a more constant flow of materials and parts by the factories, as well as their traceability since they are remotely connected and you can always know where they are, what they are doing, inventory status, origin, etc. Another of its key points is the improvement in the field of safety. The rapid response time of these devices, thanks to the large amount of sensors they incorporate to avoid any obstacle, exceeds human perception, thus reducing the risks of injury to the rest of the factory staff. 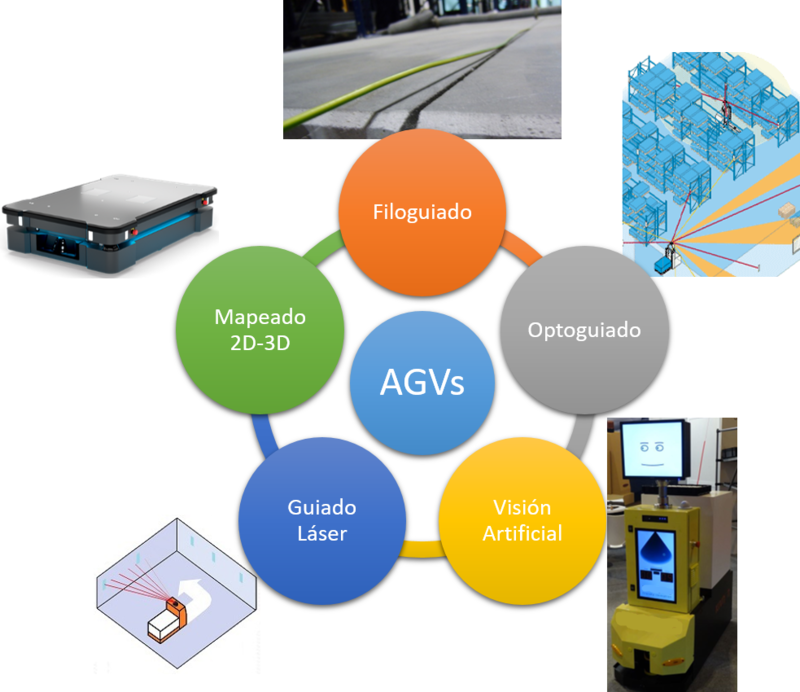 There are several technologies for guiding AGVs, depending on the external and internal elements. A correct choice of the guidance system is the first step for the successful implementation of a vehicle of these characteristics in a factory. The logistics and transport of material inside factories is one of the most critical and controlled processes because of the risk of not having the material in the necessary place at the time it is needed, causing bottlenecks that lower productivity . The solution so far has been trains, pallet trucks and bulls driven by people who carry the materials between the necessary locations. This, like any moving machine operated by people, has an intrinsic risk for both the factory operators and the transported material. Today we present the present and future of logistics and transport of materials, boxes, parts and pieces within factories: the Automated Guided Vehicles, much more known as AGVs. Explaining it in a very simple way: they are vehicles that move autonomously and transport what you put them on without the need of an operator to handle them. They can be more or less intelligent depending on the type and technology they incorporate, we will see below. In ATRIA we carry out projects with AGVs in diverse applications, from the transport of pallets and boxes, to their work with robots. This last application allows having a robot that can move between different work stations, reducing idle time and the investment of having several robots. Our job is to adapt the AGVs to your process, program them, design the software platform, teach them to be smart, learn their task and test it with the final materials, boxes etc. We like the term Smart Autonomous Vehicles, AIVs, very much, since many of the applications with which we have worked are able to learn and move naturally without guiding so that their work is even more flexible. Wire Guidance. The AGV moves guided by a wire installed under the floor, which is accessed through small slots where a rod connected to the vehicle is inserted. This method of guidance is very simple but it has the least flexibility, since the routes of movement of the AGV are limited to the routes where the wire is installed. There are some more comfortable alternatives such as magnetic tapes that avoid doing work to install the thread. Optoguided. The AGV moves guided by a mirror strip that extends by the routes of the AGV, found in the laterals of the ways (or in the floor) or in the corners where the AGV has to make a decision . By means of catadioptric the AGV can detect the guide. The installation of these mirror guides does not require floor work as in the case of the filoguiado, and the modification or creation of new routes is less complex, since it is enough to draw with mirror strips the new areas to define the movements in the AGV . Artificial vision. The AGV recognizes by artificial vision a strip of catadioptric mirror, calculating and correcting at every moment the deviation between the AGV and the route. Depending on the route you have programmed and the distance obtained through artificial vision, the AGV makes the necessary movements to continue with the predetermined route. Laser Guidance. 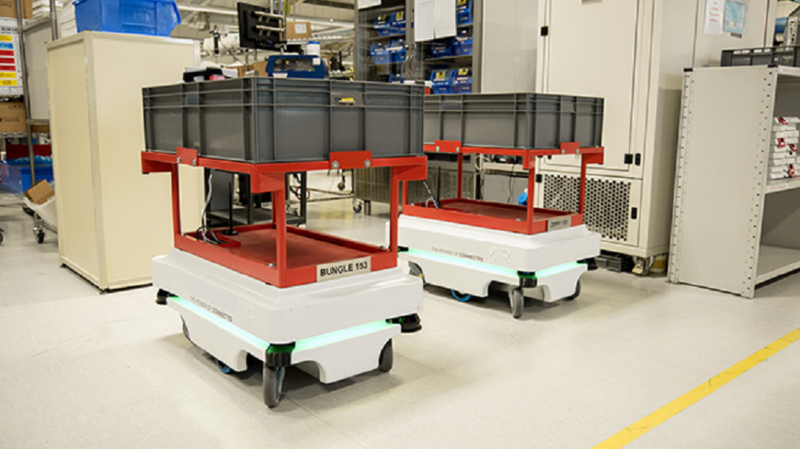 The AGV is equipped with a rotating laser unit that performs sweeps to identify in its surroundings as many reflectors as possible to determine its position in the map of the installation that it has in memory. To make the map of the installation, catadioptric mirrors are placed vertically in strategic points of every installation. These mirrors will be points of reference with which to calculate the position of the AGV, in the same way as the Optoguided ones. The main advantage of this guidance method is the incredible simplicity with which a pallet loading / unloading station can be created or a route can be modified. In just 10 minutes, a trained person can create a new route, without having to make any changes to the installation of the reflectors. 2D-3D Mapping. This technology means that it is not necessary to install any external element to the AGV, since by means of all the sensors it has on board (cameras, LIDAR, ultrasound, …) they are able to create a virtual map of the environment in which they are working (in 2D or 3D depending on the technology). This greatly facilitates the implementation of these devices, since it is simply necessary to move the AGV manually through the paths to be traveled, mapping them and internalizing all the necessary information for later use. It is of course the more flexible and adaptative system. In addition to the types according to how they are guided, there are also other classifications according to their safety, sensors, type of load etc. They are very flexible equipments that facilitate the internal transport of elements and that have many advantages such as traceability, safety and flow monitoring. In ATRIA we believe that AGVs with a good development and adaptation are equipments with very profitable. Are you ready to try them? If you want to know more, visit the robotics section or if you prefer contact us to tell us your case. Previous article Auto-repairable materials “self-healing”? Do they really work?? Next article R&D, Innovation and recycled products: New life to your sub-products!